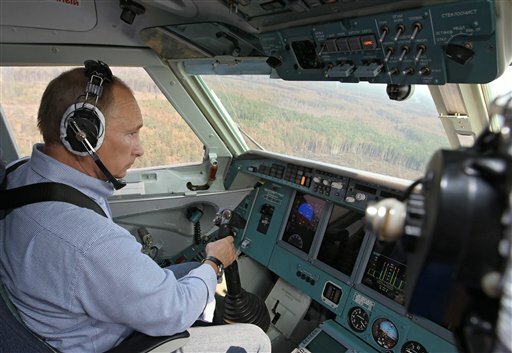 Putin’s insatiable drive to unseat Sir Winston Churchill as the greatest Prime Minister of all time has taken him into the cockpit of a firefighting plane. His mission? To battle the raging fires which threaten the Rodina. Using the finely honed accuracy which served him well in his trek to save the Siberian tiger, Putin doused the burning inferno with some earth juice scoring a “direct hit”. The stunt was classic Putin. In past years, he has copiloted a fighter jet, ridden a horse bare-chested in Siberia and descended to the bottom of Lake Baikal in a mini-sub. Just last month he drove a Harley Davidson motorcycle to a biker rally. Stunt? Stunt?!?! Really? This is who the man is, a man on a quest to cure the world’s ills. To make this world a better place one tank of water at a time, all for the benefit of us the little people. Shame on you AP journo for your nay saying. Oh, that these United States had such a figure at the top! You know if a piece of the Russian coastline suffered the same fate as the Gulf, Putin be the first one down there personally plugging the hole until BP or Lukoil could get their act together and cap it. 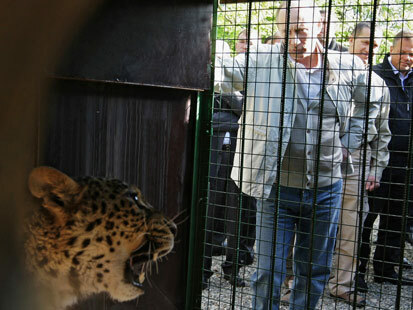 Because counting coup with Siberian tigers and riding horseback bare-chested just don’t sate his virile appetite, Russian Prime Minister Vladimir Putin has received a worthy wrestling partner from the Iranians: a leopard. Maybe Putin had to go into the animal kingdom for a worthy adversary because his wrestling (but not in that way) partner Russian President Dmitry Medvedev no longer provided a challenge. Who knows what the PM is thinking? I do know that if Volodya ever wants to test his mettle against Chuck Norris I wouldn’t want to be within a continent and a half of such a clash. Does this imply that environmentalists, as a general rule, are limp-wristed pansies? The 2010 Vancouver Winter Olympics just concluded yesterday and once again my fatherland turned in a dazzling performance… NOT. México’s Winter Olympic team consisted of one man, Hubertus von Hohenlohe, a slalom skier. El Beto (who is of German descent) managed to come in 46th and 78th in the slalom and giant slalom respectively. I bring this up not to puff up my nationalistic sensitivites (as if) but to accentuate the contrast in expectations. The Russian delegation, relative to México’s one man wrecking crew, performed gloriously. By gloriously, I mean they managed to not only win a medal but eleven of them, three of them gold! México has never sniffed a medal in a Winter Olympics. We need to think about how we change our training methods. The new training system should focus on athletes who should be put at its cornerstone, not sports federations and their executives — and not even the trainers, with all our great respect to them. Athletes are those who bring victories, and they should become the focus of our attention. We can’t even blame Russia’s “poor performance” on the fact that the Soviet Union is a thing of the past. The combined medal won by all former Soviet republics is 22, which would have put the USSR in 5th place right behind Norway. I’m sure Medvedev is going to summon experts to come up with better methods to increase his nation’s medal hauls at the Summer Games in London (2012) and the next Winter Games in Sochi (2014). I, however, have more helpful advice and it’ll probably cost less rubles. President Medvedev, in your pal, Mr. Putin, you have a national treasure but more importantly, an athletic and versatile golden goose. If you don’t want him, surely I can petition the Mexican government to grant him honorary citizenship so at least we can hold our heads high at the next Olympic Games. I can see it now in Sochi, El Putin and El Beto wiping the floor with the field in the 2-man luge and the cheers ringing out from El Zócalo to Cabo San Lucas: ¡Putin! ¡Putin! ¡Putin! 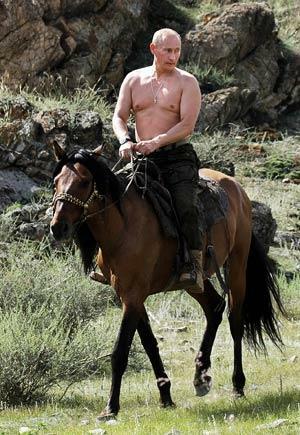 As chronicled here and here, the inimitable Prime Minister of Russia, one Vladimir Putin (all Spanish speakers say “hey-o!”), has a penchant for getting in touch with his masculinity or at least getting photographed in virile poses. Eat your heart out Chiron and Firenze, here comes the P.M.
You can read about his latest adventure here. One can almost say Putin’s feats of strength are his attempts of shaking the unshakable Spanish translation of his surname. Back in our college days, my friends and I would frequent one of our glorious university’s computer labs. Since we attended college at around the time that chat rooms were beginning to proliferate, our time was spent talking to people we’d never meet. Naturally, using the anonymity that the ‘Net grants, we’d play all sorts of pranks on each other. Without going into detail, let’s just say that some of them were epic. This kind of tomfoolery would extend to acquaintances. We knew these 2 guys and on one occurrence we tried to punk them via chat room. They must have caught on because one of them (the spymaster) sent the other on a mission unworthy of Dzerzhinsky. The fact that our counterespionage efforts uncovered the plot reveals the efficacy of our nemesis’ total lack of subterfuge. After this incident we glossed this guy, “Beano the Spy”. 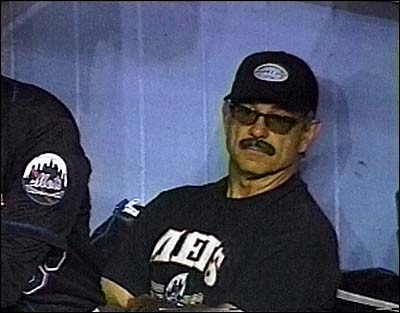 It is this lack of subterfuge and underhandedness to which I pay tribute to on this day. 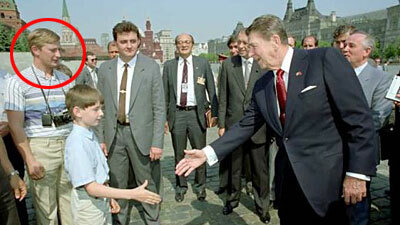 As noted before, Russian Prime Minister Vladimir Putin is into overt displays of masculinity. 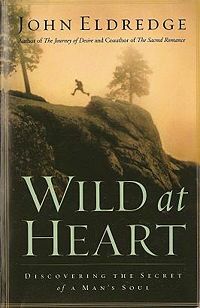 ‘Without sports, it’s impossible to speak of a healthy way of life, about the health of the nation as such,’ he said. Are we playing “Capture the Flag” or “King of the Hill”? 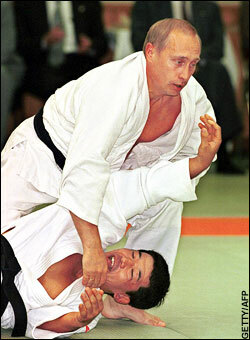 Yeah I know Russian Prime Minister Vladimir Putin looks like he’s in the middle of a rather extreme (no face mask!) game of paintball, but no that’s not the case. 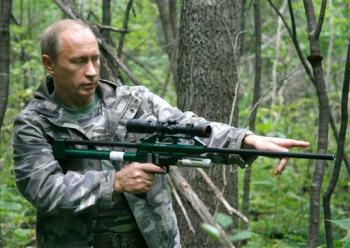 No, Volodya went on a little expedition to save the Siberian tiger (that’s a tranquilizer gun by the way). According to the story, this is but another attempt to boost the Prime Minister’s manly man image. In eight years as president, the popular Putin burnished his image with televised appearances that painted him as a tough, healthy and energetic young leader eager to take on new challenges. Good for him (for caring enough about the magnificent beasts) but I know that at least in México, with a surname like Putin he’s going to have to do a little more than brandish a glorified paintball gun marker to toughen up his image. 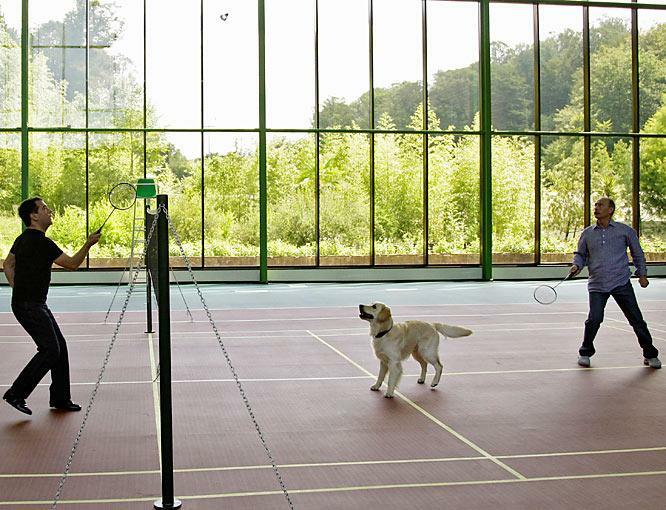 That has to be the nicest badminton court I’ve seen, but then again I have not seen that many. I wonder if Russian Prime Minister Vladimir Putin (right) informed President Dmitry Medvedev (left) that this was going to be a mixed doubles match. Qué mañoso Volodya, qué mañoso. When I saw this pic, it reminded me of that Taco Bell commercial starring Hakeem Olajuwon and Shaq back in the day. AIDS Activists “Pine” For Dubya?